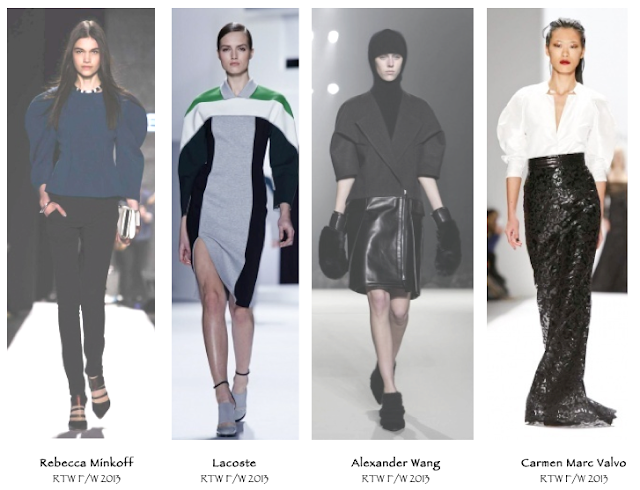 CocoChic: NYFW Trend Report: Part One, Thanks for Mutton! It's the best time of the year: Awards Season and the debut of the Fall/Winter Ready to Wear collections! I haven't posted in a while, but be sure I've been focused on New York, London & Milan Fashion Weeks and will of course be posting about Oscars style in the coming weeks. One of my many favorite things to do while reviewing the latest Fashion Week shows is to find a correlation between the collections- as these are key indicators of the upcoming style trends. A major structural element that I noticed for Fall/Winter 2013 is the dolman/mutton sleeve. This exaggerated silhouette creates a roomier yet architectural arm which results in a very modern look. Some varying ways that designers styled this trend are highlighted below. At Rebecca Minkoff, the style is parlayed into a more wearable option, even suitable for the office. At Lacoste, their traditionally sporty styles got an update featuring the dolman/mutton look with colorblocking. Alexander Wang displayed his avant garde origami-like sleeves with matching headwear and fur boxing gloves. At Carmen Marc Valvo, this trend is complemented with a high-waisted sequin skirt for an elegant take on the silhouette. Will you be working this trend into your wardrobe? I'll leave you with this quote by the amazing Zac Posen: "This season, there's a leaner line- more emphasis on the shoulders, less on the cinched waist."